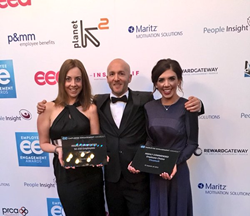 The award winning digital agency has been awarded two highly commended titles at the Employee Engagement Awards 2015, held in London. This year’s entrants have provided powerful proof of how investing in employee engagement translates to very tangible business value. The company was triple shortlisted back in November for the Employee Engagement Awards 2015 and picked up two highly commended titles for the Employee Choice Award (judged based on feedback from Visualsoft employees), and the Project of the Year Award (Private sector – 50-250 staff). Visualsoft is a full service eCommerce agency with a pioneering approach to management. In addition to unlimited holidays and flexible working, the company also offers staff free breakfast, free protein and health supplements, and subsidised gym memberships to keep employees healthy and motivated. One year on from the introduction of the benefits package, Visualsoft has recorded some impressive stats - the company has seen a positive rise in all areas of the business, including staff morale, creativity, productivity and client satisfaction. The EE Awards recognises and celebrates the people and companies who reinvent the way organisations think about and engage their employees, to achieve their purpose and reach maximum productivity. Visualsoft has seen huge organic growth over the last three years following the opening of two new offices across the UK and a substantial increase in the number of new clients. Since it was established in 1998, the company has grown at an average rate of 300% per year, and now has a portfolio of over 1100 clients from the UK and Europe. For more information about Visualsoft, visit http://www.visualsoft.co.uk/careers.